A facile, sensitive, selective, and reproductive formaldehyde sensor has been developed based on polymer modified quartz crystal microbalance (QCM). 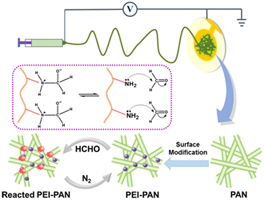 A nanostructured complex, polyethyleneimine (PEI) functionalized electrospun polyacrylonitrile (PAN) nanofibrous membranes (PEI-PAN) is utilized as a novel sensing coatings on QCM. Taking advantage of the large surface area, high porosity, and large stacking density of electrospun nanofibrous membranes, the sensors achieved a low detection limit of 1 ppm and a fast response. Moreover, the sensitivity of PEI-PAN fibrous membranes coated QCM sensors are two times higher than PEI flat film ones as formaldehyde concentration is 1 ppm. Furthermore, based on the reversible nucleophilic reaction between formaldehyde and primary amine groups of PEI, the sensors exhibit good selectivity and reproducibility. Hence, such a promising QCM sensor could potentially not only be used to detect formaldehyde, but also facilitate the design and development of novel sensing systems based on nanofibrous membranes.